Last night I was busy transferring a tutorial from my old Lenscraft site to this one. The tutorial in question explained how to create a Holga Effect using Photoshop and was written in 2007 (I can't believe it was so long ago). Given many photographers now prefer Lightroom to Photoshop I thought I would write another tutorial explaining how to simulate the Holga Effect in Lightroom. If your reading this tutorial, chances are that you are a fan of the Holga camera and want to know how to create a Holga style effect digitally. But in case you stumbled on this article not having seen a Holga camera, here is a useful link to Wikipedia (http://en.wikipedia.org/wiki/Holga). In a moment we will run through the step by step process but first you need to select and prepare your photograph. This involves processing your image so that it's finished to a level where you need only add the Holga effect. 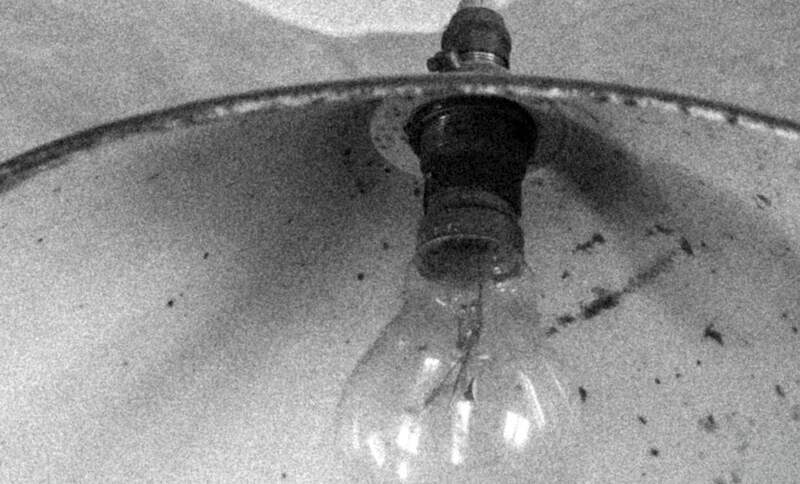 The majority of genuine Holga images are shot using Black and White film. If you intend to produce a black and white simulation you need to convert your image to black and white before starting. Most Holga users have their Holga set up to shoot square format images. Typically the centre of the image will be the only thing in focus. 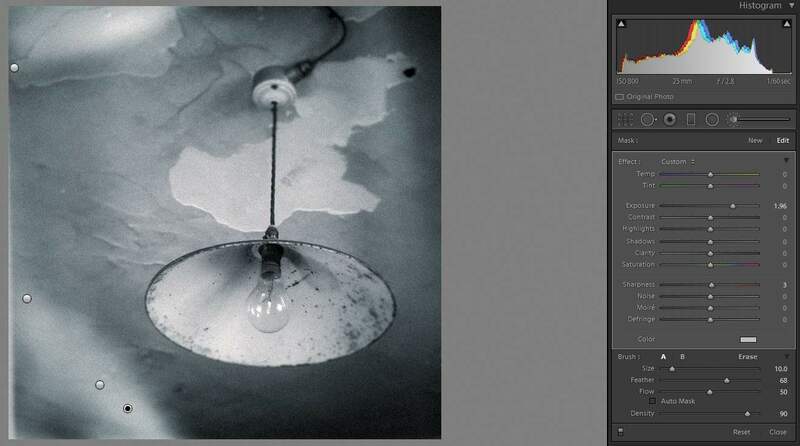 You should therefore pick an image that once cropped to a square, will work compositionally. With that said, here is the image I have chosen to use. 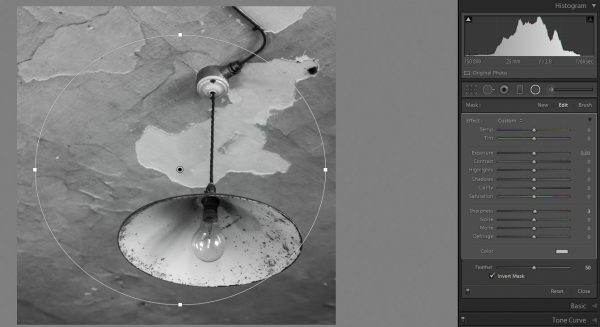 The following steps are performed in the "Develop" module of Lightroom and assume you are familiar with the tools in this module. Step 1 - Crop the image to a square format. Select the Crop tool and chose the 1x1 crop Aspect. You can see this in the screen shot below. This will place a square crop mask over your image showing the selected area. This can be repositioned by clicking on and dragging the image around. You can also resize the crop area by clicking and dragging on any of the corners. Once your satisfied with the size and position apply the crop. The Radial filter was introduced in Lightroom 5. 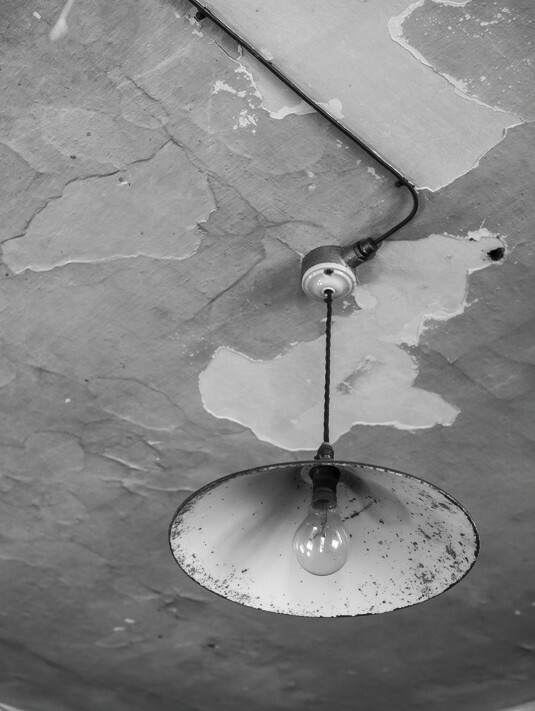 If your using an earlier version of Lightroom you will need to miss this step. Don't worry though as you can use a similar technique using the Gradient filter tool described later. You would just need to add a lot of Gradient filters around the edges of your image. In the following screenshot you can see the Radial Filter being drawn. By default it's the area outside the circle that's affected by the adjustments you make. You can reverse this by checking the "Invert Mask" option. This will cause any adjustments you make to be applied inside the circular area of the filter. As we want to blur the edges of the image ensure this option is unchecked. To create the blur to the edges you should move the "Sharpness" slider all the way to the left and the "Noise" filter all the way to the right. The other slider to use is the "Feather" slider so that you blend the blur effect with your image naturally. As setting of 50 is probably the lowest you will want to use. It's unlikely that you will be able to achieve sufficient blurring effect with a single Radial filter. You should therefore add a number of these but ensure they are all slightly different sizes, shapes and positions so that the blur effect is blended into the image. This is done in the "Effects" section of the development settings panel. You can see an example in the screenshot below. I like to use the Effects panel rather than a Radial filter as the Effects panel works post any crop changes. In this screenshot you can see a negative "Amount" setting has been used to darken the edges of the image. But don't copy my settings, experiment with your own as each photograph will respond differently the settings. Some will even work better with a lighter vignette. The other setting in the Effects panel is Grain. You can see the settings used in the screenshot above but it's important to zoom in to 100% on your image and examine the grain. If you intend to print the finished image I recommend zooming the preview to 50% as this gives a nice indication of how the printed grain might appear. Below you can see a section of the image previewed at 100% in order to check the grain. Review a number of genuine Holga images and you will begin to notice the edges of the frame are sometimes dark and possibly not square. This can happen where the insert inside the camera moves so blocking the edge of the frame. 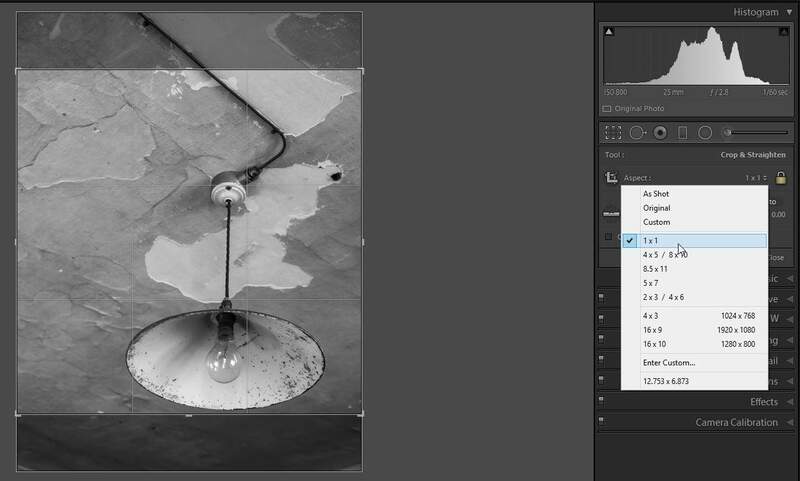 To simulate the effect in Lightroom you can use the Gradient filter as can be seen in the screen shot below. Don't be scared to add multiple Gradient filters to build up the effect. 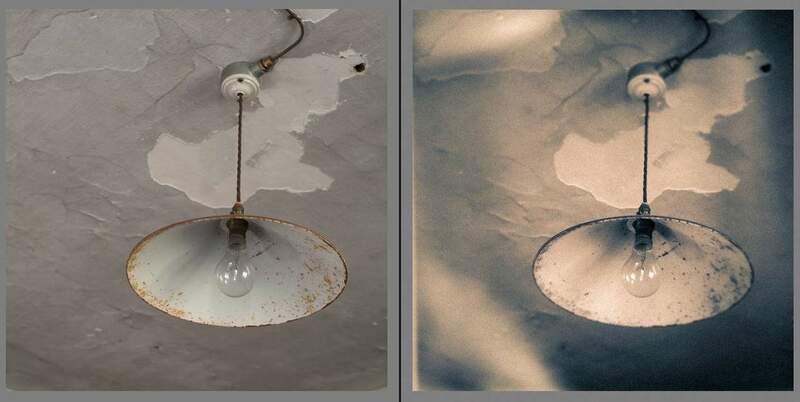 You can also experiment with lightening these edges so as to simulate the appearance of a light leak. Light leaks are synonymous with the Holga camera. The back of the camera tends not to close properly and can often allow light to enter which exposes and damages the film. I actually became so annoyed with the back of my camera popping off (ruining my images) that I now tape it on with masking tape. You might argue that these light leaks are part of the charm of a Holga but it can be infuriating when they ruin an entire roll of film. As well as being able to simulate a light leak using the Gradient filter you can also use the Brush tool and increase the exposure. You can see an example of this in the screen shot below. When you come to simulate your own light leaks its again worth spending time to build up the effect using multiple brushes. Also remember that the light leak tends to be strongest to the edge of the frame. The final, optional step is to tone the image. 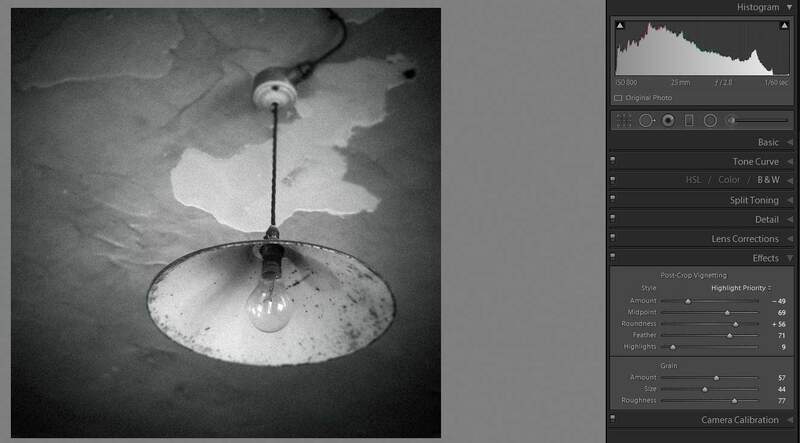 Toning an image doesn't appeal to everyone but Holga style photographs usually respond well to toning. 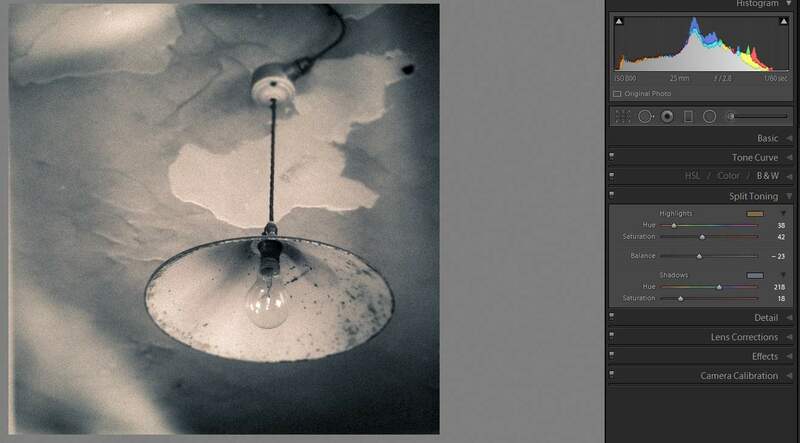 Here you can see a split tone adjustment being applied to the image. Once you are happy with the adjustment save your image. 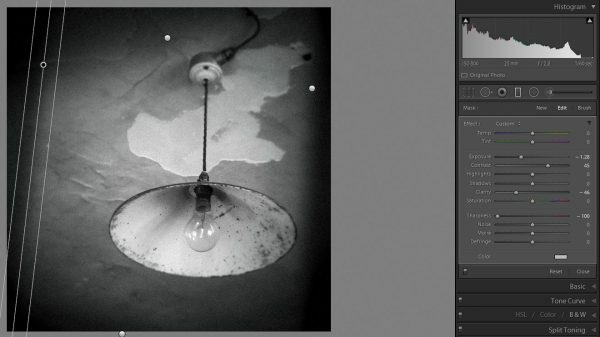 Processing a digital image to take on the appearance of a Holga photograph is possible in Lightroom though the effect is easier to achieve when using Photoshop. Despite this the enhancement can turn an ordinary image into one with much more character and interest. Below you can see a side by side comparison between the original image (before any processing) and the finished image. You might also like to know how to simulate the Holga look digitally in Photoshop. If you want to learn more about photo editing in Lightroom and Photoshop you can find my in-depth (and affordable) books in the Lenscraft Shop.